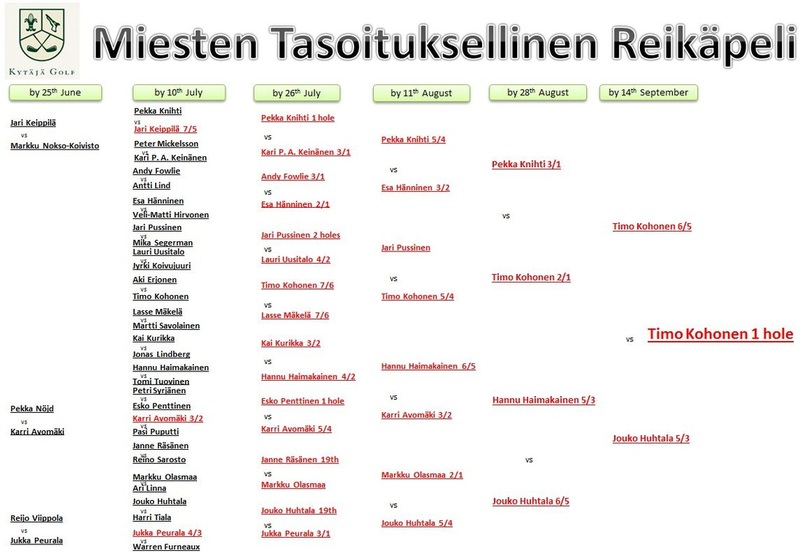 The final of the 2013 Tasoituksellinen Reikäpeli was played on the 23rd September between Timo Kohonen and Jouko Huhtala, eventually Timo managed to seal a victory by 1 hole as darkness fell on the 18th green. See below for a great account of the final, written by the runner up. (Finnish version coming soon hopefully). Well we started with the fact that Timo had 5 strokes over me so I knew I had to play pretty well to have a chance – knowing that Timo is a great and competitive player. On 9th we both hit the green, but Timo three putted for bogey while I made a par to get back to 2 down. The tenth was interesting – I hit the green maybe 4 meters from the hole and Timo missed his tee shot 20 m short and to the right. But then he pitched to 20 cm – what a shot! I two putted to split the hole. 11th was probably the best golf for the whole round – it was a pity that no one was there to witness it. J We both hit great drives with ~110 m to go. Timo went first and nailed it to ~1.5 meters from the pin. I followed to about 2.5 meters. Two putts for both and Timo was still 2U. 12th was Timo’s hole with solid golf. Green in regulation and two-putt par. I missed the green and two putted. Timo went 3U. At this time the weather turned bad – it had not been very pleasant with 12 degrees, showers and some wind, but now the opposite shore of the Kytäjä lake was barely visible thorough the rain. Wind from the lake picked up too with the approaching black cloud. Timo won the 13th with a solid four to go 4U. On 14th tee it Timo pulled two drives to the left with hard right to left wind assisting. The first was lost and the second was next to the 11th tee box. I found the fairway bunker next to the steep lip and barely got the ball up enough to find the next bunker. It took me two shots more to reach the green. Timo hit the water next to green so we moved to next hole with Timo now 3U. At this point I decided that at minimum I have a chance to clean up the numbers a little bit before we shake hands. On 15th we both found the fairway with our tee shots. Timo had to layup and I pulled my 3 hybrid from 180 meters to the furthermost left greenside bunker and was able to hit the green from there. Timo found the right side rough with his third shot. I finally won the hole with a five against Timo’s seven. I was only 2 down. 16th was again match play at its best. With everything soaking - including grips - we both missed our tee shots: Timo short of the sideways bunker between the green and ladies tee. I missed to the rightmost bunker (Yes the one, that looks not really to be in the play at all) after almost losing my club due to wet grip. Timo hit the green and I missed short and then again chipped short with ~5 meters to go. Timo two putted for bogey. But this is match play so I sank my longish bogey putt to remain 2 down and take the match to 17th. 17th had a good tail wind. Rain stopped and we both found the fairway. Timo hit his second to right of the green and chipped to 2 meters. I hit the green, ~5 meters above the flag. And sank the birdie putt! Timo was now only one up. It was ten past seven in the evening and it was getting really dark, so we could not really see the landings of our drives on 18th. I even hit a provisional to make sure I had a ball in play. Timo missed to the right and found the first fairway bunker with his second. Eventually we found my first one on the fairway but then I hit a really bad shot to the edge of the forest on the right. (what a moment to hit a socket…) We both scrambled to less than hundred meters, and hit the right side of the green on our fourth shots. We both two putted for bogey and shook hands. Timo won by one hole. When we reached the clubhouse it was past the closing time – Timo almost had his stuff (including his car keys) locked in, but fortunately the ladies we few minutes late leaving for the day so they let him in. By the time I started the car temperature was 8.5 degrees. It was fun and exciting despite the foul weather! Congratulations to Timo!